Trade has become an issue in the political party primaries of the US Presidential elections that holds lessons for the countries of the Caribbean Community (CARICOM). I note first that, as far as I am aware, trade has never been an issue in the general elections of the 15 member countries of CARICOM, even though from time to time CARICOM itself has been raised on the political hustings. On the occasions when CARICOM has been the subject of general election discourse, the focus has been on immigration when some politicians have sought to gain political visibility by climbing on the back of anti-immigrant sentiment. Interestingly in the current US political debate – if what transpires in the Republican camp can be dignified by that description – both immigration and trade have emerged as issues. At the extreme is Donald Trump who is now leading in the Republican Party primaries. On immigration, Trump wants to build a wall to stop Mexicans from entering the US; he wants an all-out ban on all Muslims entering the country; he blames other immigrants for “low wages” in the US (as if they pay themselves) and for taking jobs from Americans (even though the Americans do not want such jobs, mostly manual labour). And, of course, he blames immigrants for crime in the US, claiming that they are, among other things “rapists”. The fact that the vast majority of criminals in prison are US born and grown does not temper Trump’s vitriolic assertions. As happens when any untruth is persistently repeated and goes largely unchallenged by the media that helps to spread it, Trump’s untruths on immigration have become fact in the minds of his supporters whose numbers, unfortunately,seem to be growing. In the course of all this – and in the remarks he makes at his rallies – Trump is feeding an insurgent racism in the underbelly of the US, particularly among Ku-Klux-Klan activists and nazi-types. In throwing out protestors from his rallies and encouraging their manhandling – one a young, black woman unarmed and alone – Trump has declared that he would himself like “to punch them in the face”. Thankfully, in the Caribbean, even among the worst of the politicians who have played to the anti-immigrant lobby, the situation never quite reached the depths to which Trump has sunk. But, it is worth noting that, curiously, the convulsions concerning immigration in the Caribbean have been directed by Caribbean people to Caribbean people. It seems that immigration of others (North Americans and Europeans), including taking jobs, is more acceptable; it is immigration amongst Caribbean people that is most unpalatable. Let’s stick a pin on inter-Caribbean migration for a moment. We will return to it. For now, let us consider the outbursts on trade that have flowed from Donald Trump. He blames trade with Mexico, China, Japan, India and Vietnam for the loss of jobs in the US. In this regard, he intends to “tear-up” the North American Free Trade Agreement (NAFTA) – the main arrangement for trade and investment with Mexico. It appears to have conveniently escaped him that Canada (the US’ single largest trading partner) is also party to NAFTA, and that tearing-up the agreement will adversely affect trade with Canada as well. It also seems to have eluded his attention that NAFTA is a legally binding agreement with arbitration provisions. Further, since it is an agreement that exists under the umbrella of World Trade Organisation (WTO) rules, that international body for setting trade rules might have something to say about it. Trump seems to believe that trade should be a one-way street for the US, and that if he closes or reduces trade with the countries he has listed, they won’t retaliate by buying less US goods and services. It also seems to have missed him completely that no country is compelling Americans to buy their goods and services, and no country is forcing US companies to locate outside the US. US consumers buy goods and services from other countries because they cost less, and US companies locate in other countries because costs of production are cheaper, including labour and talent. The fortress into which Trump wants to makes the US against trade and immigration (two things that have built the US economy) will quickly become a prison. Instead of keeping out imports and immigrants, it will keep in expensive goods and services as well as confine Americans. Additionally, it would set off a global trade war. And, as history, has taught, all wars of violence start from an economic base. Sadly, on the other side of the political divide in the party political primaries, Bernie Sanders of the Democratic Party also blames trade for loss of jobs. He too wants to tear-up NAFTA and all other trade agreements, including the Free Trade Agreement with Central American countries and the Trans-Pacific Partnership. All of them, he says, have cost thousands of Americans to lose their jobs. There is, of course, evidence that factories have been closed and jobs have been lost in mid-western states of the US because of their lack of capacity to compete against production of similar goods from other countries with cheaper labour costs and lower tax rates. But, the jobs – real or potential - that have been lost in the vast majority of countries of the world that import from the US are far greater than losses in the US. The problem in the US is that, despite its great resources, it made very little provision for replacing inefficient companies that could not cope with competition, and it did not invest in retraining workers that were displaced. Even re-generation of towns and infrastructure for transportation was neglected. 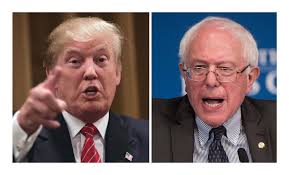 So, both Trump and Sanders have escalated a one-sided argument on trade for their political purposes – designed to lure both disaffected and supremacist Americans into blaming trade with selected foreign countries for their view of that they have “to make America great again”. Incidentally, India and Vietnam are not among the top 15 of the US trading partners; they rank well below Britain and Germany for instance. Why Trump blames them is consistent with his unfortunate racial and religious profiling. Sensibly, Hillary Clinton has not descended into these arguments which cannot stand up to factual analysis.